At ILS we can apply our engineering skills to challenging non-standard problems to deliver a system for our clients. These will not be the batch or fixed bed reactors we’re most recognised for, but will still display the same hallmarks of the high-quality ILS Approach: innovative design, robust validation and successful commissioning. A number of years ago, Clariant chose to significantly increase their capabilities in partial oxidation catalysts. As part of this initiative the decision was made to improve their Vinyl Acetate Monomer (VAM) catalyst technology. Clariant is one of ILS’ oldest clients and has a proven track record of making highly-customized units for them. For this reason ILS was chosen as a supplier of two, high-throughput Temkin-type reactors systems. The advanced Temkin reactor designed by ILS was an improvement upon the original Temkin reactor system developed at the University of Moscow in the 70’s. The Temkin reactor has the unique ability to make it possible to test eggshell-type catalysts without requiring crushing and seiving, which would otherwise result in mostly inert material being tested. 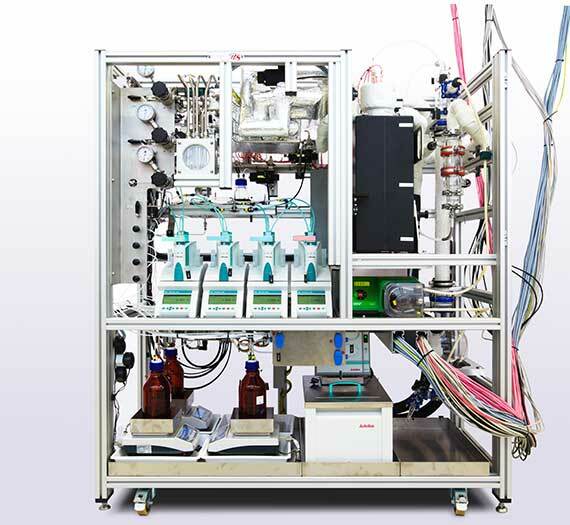 ILS worked closely with Clariant on this project to develop a Temkin module design that was flexible, had minimal bypassing and excellent plug-flow characteristics. The plug-flow means that high conversion levels can be attained and high interstitial linear flow velocities result in excellent heat transfer and prevent film-diffusion effects from masking catalst performance. 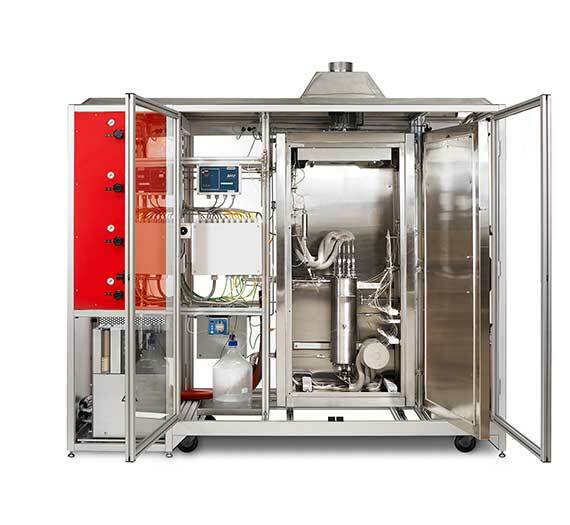 The unit has a downstream nitrogen purge system combined with a custom heated-valve oven, which prevents VAM condensation and self-polymerization, which can potentially lead to blockage of downstream tubing. 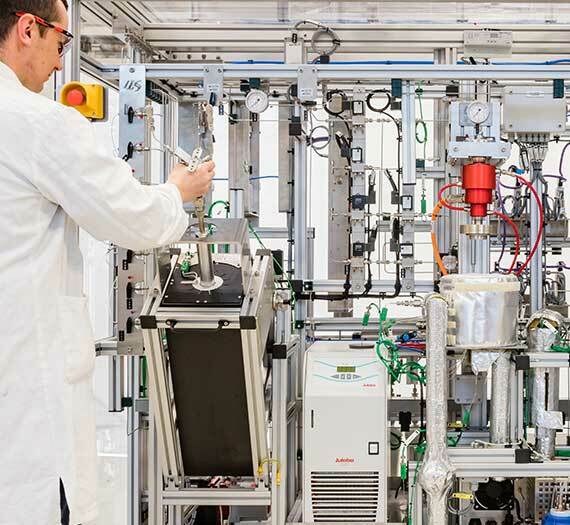 Full integration of online GC-analytics as well as a total combustion reactor for reacting unconverted material to CO2 and water resulted in a complete, turn-key system. Two of these units were successfully constructed and commissioned for Clariant. They have proven to be the workhorse of the VAM catalyst development group and have been integral in helping Clariant develop their latest generations of commercial VAM catalysts. Renewable energy storage is a topic of immense interest at the moment. One approach to this is the so-called energy-to-gas approach. Here, green electricity is used to generate hydrogen from water. This hydrogen can then be used to methanize CO or CO2 to methane, which can then be stored and later burned to generate electricity. One of the challenges in this young industry is accurate prediction of methanation catalyst behavior when operated under the transient conditions, which are inherent to the renewable energy production where wind and/or solar energy supply is periodic as opposed to constant. The group of Prof. Thomas Turek is ILS oldest client and came back to ILS with a request to design a novel reactor system to help them determine the transient reaction kinetics of methanation catalysts. Numerous challenges had to be overcome for this unit. The TU-Clausthal wished to have the ability to operate the reactor either as a plug-flow reactor operating at high-conversions or as a completely backmixed CSTR reactor with differential per-pass conversions and no temperature or concentration gradients. Additionally the unit had to be capable of generating delta-shaped concentration shifts down to a sub-second switching frequency. ILS designed a special high-speed, electronic valve actuating system with minimal dead volume to attain this. 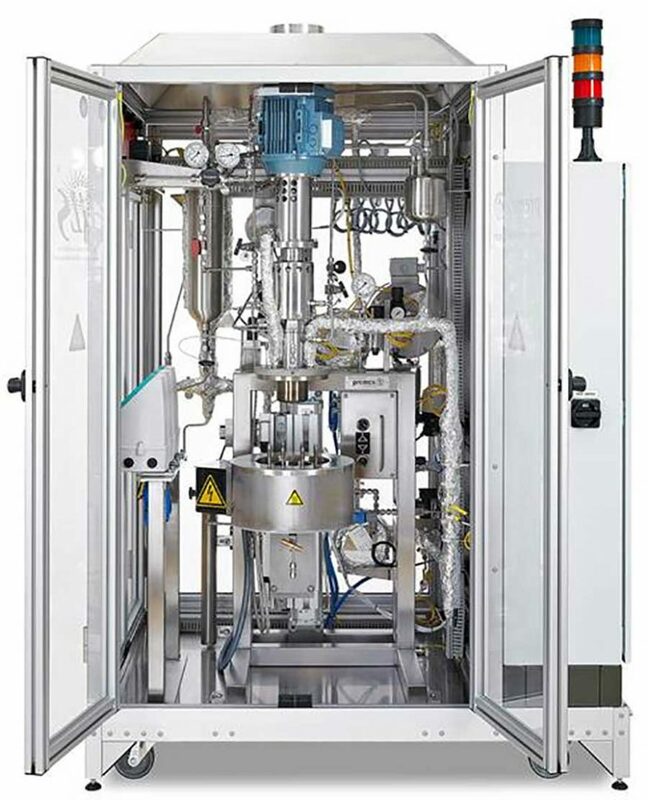 Implementation of the unique internal-recycle reactor technology, which ILS has licensed in from the FAU University in Erlangen made possible the perfectly back-mixed operation of the CSTR reactor. ILS seamlessly integrated a mass-spectrometer allowing for quantitative and time-resolved analysis of all products formed. The unit was delivered on-time with an extremely short commissioning time of only 2 weeks. We are proud to see that the group of Prof. Turek is already submitting abstracts for presentations to show the extremely exciting results of their first transient studies, which clearly show that steady-state models used by the refining industry apply poorly to the transient conditions experienced for these green-energy applications. The ability to synthesize heterogeneous catalysts with specific atomic structures is a key part of making high-performance, novel catalysts. One established technique for this epitaxial growth. 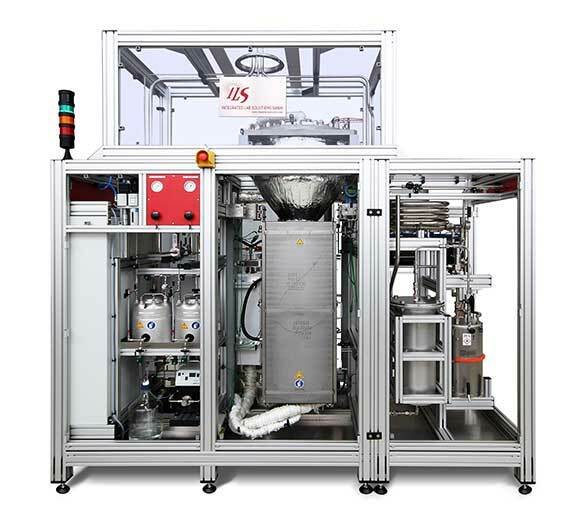 For this project, a major catalyst manufacturer approached ILS to provide them with a novel epitaxial growth catalyst-preparation unit for their laboratories in India. One of the main challenges of this application was working with extremely air- and moisture-sensitive TiCl4. This material reacts immediately upon contact with oxygen or moisture. The resulting HCl vapors are toxic and extremely corrosive and the SiO2 formed quickly results in line blockage problems. ILS worked closely with the client to design a corrosion-resistant unit, than can be operated in the absence of oxygen and moisture. A complete scrubber system was provided to wash out all HCl formed during reaction, insuring that the unit met the tight emissions regulations required by the client. The unit has been in operation for 2 years now and is an important tool in the arsenal of catalyst preparation units used by this client. Hear ILS CEO Anton Nagy describe time-saving and practical tips in a series of short videos. You'll learn some of the methods which help ILS manage risk and avoid delays when they deliver highly sophisticated reactor systems. Ionic liquids are promising materials as catalysts. A major barrier to their implementation is the fact that they are liquids, which must be continuously fed and removed from reactors. The FAU University in Erlangen is one of the world leaders in ionic liquid R&D and in supporting ionic liquids to make SILP catalysts. ILS was chosen by FAU for this extremely innovative project. ILS designed a fluidized bed reactor for the coating of fluidized support material with ionic liquids. The fluidized bed provides excellent isothermicity as well as high-turbulence and back-mixing to insure good heat transfer and homogeneous support coating. ILS performed the necessary calculations to insure the the unit could be operated in a truly fluidized hydrodynamic regime. Implementation of a high-temperature differential pressure dP sensor made possible the direct measurement of the fluidized bed height in the reactor. A high-power pre-heater was used to insure that material was at the desired temperature upon entering the reactor. ILS designed a reactor geometry, which not only provided optimal fluidization but also nearly perfect separation of the materials from the high gas flow, hence minimizing product loss. The unit was commissioned in an extremely short time and has been in operation for about 3 years now. We are proud of having an ongoing fruitful collaboration with the FAU university. Corrosion and erosion occur in reactors of all types. FCC reactors are recycle fluidized bed systems, which have highly-abrasive zeolite catalysts moving at extremely high linear velocities. Especially in areas where pipe-bends or hindrances are present, significant material loss of the reactor walls can occur. This presents a serious operational and safety problem for FCC reactor operators. The goal of this project was to develop a unit capable of testing multiple metal coupons with various novel coatings under similar shear conditions to those found in commercial FCC reactors and using realistic FCC feedstocks. This project is an excellent example of the ILS approach to reactor design. The client intitially approached ILS with a design, where she/he wished to generate the necessary shear by pumping the liquid at high flowrates over metal coupons with narrow gaps capable of generating the required flow velocities. ILS performed initial calculations on this proposal using Reynolds numbers and rheological properties provided by the client. ILS came to the conclusion that this approach would be mechanically extremely difficult to realize and generate a huge pressure drop. ILS proposed a novel reactor, where we basically turned the concept from our client on its head. Instead of pumping the liquid, we developed a novel rotating drum reactor, where an internall rotating drum wiht a narrow annular gap generates the required shear for 4 samples located symmetrically around the drum. The high temperatures required would result in oil cracking and coke formation under normal conditions. ILS was able to minimize this problem by continuously recycling the FCC feedstock through the annular gap, insuring a short residence time at high temperatures and immediately cooling the oil and storing in a lower-temperature resevoir. This project was extremely successfully and set a new milestone for materials testing for this client. It has been in operation for nearly 6 years now.